I’m fascinated by fire escapes as a visual entity. 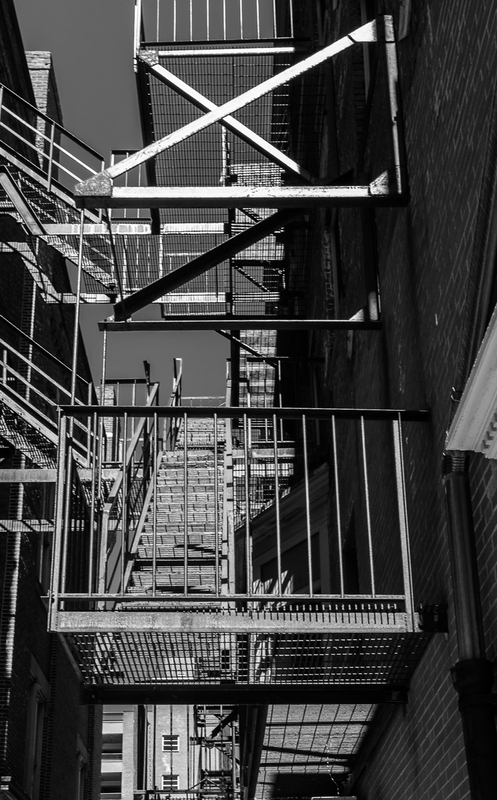 I also rarely end up getting the image that I imagine when I shoot fire escapes. This is close, but not there. Yet it is better, I think, than may of my prior efforts. I am not sure why fire escapes present such difficulties for me. I think in part it is a function of geometry, perspective and lens distortion. As previously mentioned (click the Worcester tag or search the site for Worcester) I spent a couple of hours walking around Worcester, MA on a Sunday afternoon in April of this year, on the way back home from the Lawrence, Massachusetts Mill Light Painting Workshop.